Body By Design: The Complete 12-Week Plan to Transform Your Body Forever was created by Kris Gethin, editor in chief of the popular online fitness site Bodybuilding.com. It includes a comprehensive fitness and diet plan designed to transform your physique and put you on the path to a healthy and active lifestyle. However the true core of the program involves creating a strong social support structure in conjunction with goal setting and techniques for maintaining motivation. Body by Design asserts that contrary to popular opinion, fitness success does not come from “doing the right number of reps, burning the correct number of calories, or eating the perfect amount of protein.” Kris Gethin cites new research revealing that the secret to attaining true fitness is connecting to a proven system of motivational support. Dieters can find this support by joining “BodySpace”, the popular online community associated with his website, Bodybuilding.com. In Body By Design, dieters are introduced to “The Four Pillars of Power”, which, according to Kris Gethin, provide the key to long-term success. Live out Loud: Making a public announcement of your goals can dramatically increase your chances of following through. Get Radical: Become involved in a group of others with similar goals. This can inspire healthy competition and positive feedback. Take It Home: A true change in lifestyle must take into account factors that exist outside your new motivational support system. You will identify how and what to change so that you will be able to maintain your determination to stick with the program. 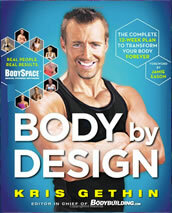 Body By Design includes a 12-week fitness program and practical details regarding how to eat to transform your body. The dietary recommendations involve eating six small meals a day, each containing a palm-sized portion of lean protein, a palm-sized carbohydrate source, a fist-sized portion of vegetables and a tablespoon of a condiment. You also should drink a gallon of water a day and add nutritional supplements that boost performance and muscle recovery. Foods to be avoided include sugars, refined grains, fruit, yogurt, milk, nuts, avocado, legumes, oils and alcohol. Egg whites, chicken and turkey breast, lean steak, veal, protein powder, fat-free cottage cheese, soy, whitefish, salmon, brown rice, wholemeal pancakes, whole wheat pasta, sweet potato, yam, potato, oatmeal, whole wheat bread, broccoli, mushroom, tomato, lettuce, cabbage, spinach, zucchini, fat-free salad dressing, salsa, mustard, balsamic vinegar, soy sauce, coffee. Body By Design includes a fully illustrated, 12-week fitness plan involving three distinct phases. By changing your routine often, you will “shock” your body and be able to do much more than you expect. A variety of strength training exercises are performed on three days of the week and they can be done in the gym or with home fitness equipment. You will do cardio exercises at a moderate intensity every day for 20-35 minutes and twice a day on the days that you don’t do weight training. Body By Design: The Complete 12-Week Plan to Transform Your Body Forever retails at $24.99. Emphasizes the role of social support, goal setting and motivation for successful adherence to a weight loss or fitness program. Eating plan is simple and easy to follow. High intake of protein reduces appetite and promotes retention of muscle mass when dieting. Provides information about nutritional supplements that may assist with workout performance and recovery. Body By Design includes a very detailed fitness program. Includes transformational success stories, which will be inspiring for many readers. Eating plan is very restrictive and eliminates some healthy foods including fruit, nuts, legumes and avocado. Some dieters may not enjoy eating six meals a day. Body By Design’s exercise plan requires a degree of commitment. Workouts require gym membership or home fitness equipment. Body By Design developed by Kris Gethin is a 12-week program created to help you to transform your body and commit to a new healthy lifestyle. While the fitness and eating plan are similar to other bodybuilding-style programs, the emphasis on the role of social support and unique information regarding motivation really sets this program apart and will increase the chance of dieters experiencing success, both in the short and long-term.